Utah Grizzlies coach-GM Tim Branham decided on this season’s team captains rather than a team vote, but said that if the players were to pick, he’d confident their picks would have been the same as his. 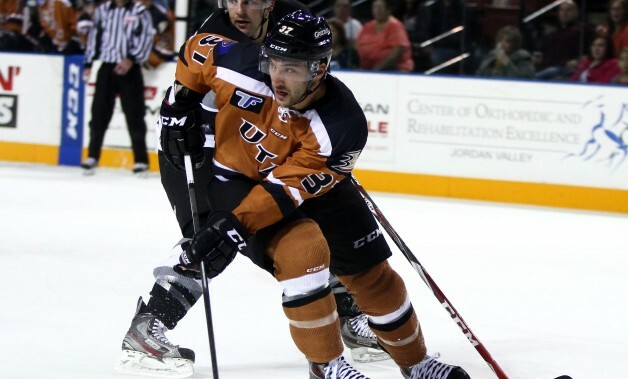 For the 2015-16 ECHL season, Brent Gwidt will wear the ‘C’ and Barry Almeida and Alex Gallant will assume alternate captain roles. Gwidt (pictured) is in his fourth season in Utah after captaining the University of Nebraska-Omaha during his college days. He served as an alternate captain for the Grizzlies last season. For Almeida, currently on the sidelines with an upper-body injury, he’s the on-ice voice for the Grizzlies, said Branham. Branham went on to say that Gallant has the toughest job of anyone on the team. Looking ahead, Branham is hopeful that the Grizzlies can keep building and improving.